Dressageclinic.com is pleased to present this demonstration with well-respected European rider Ingrid Klimke coaching various horse and rider combinations over the two-day NEDA Fall Symposium. Ingrid Klimke was a guest speaker with veterinarian Dr. Goesmeier at the 2014 event. 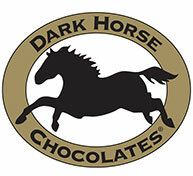 Ingrid is no stranger to the equestrian spotlight and has competed in many Olympic and International events. Her experience training horses has included the use of cavaletti to strengthen and balance her horses. " I grew up with cavaletti. I can't even think of schooling without the cavaletti. Now I have cavaletti every day in my work." Watch Ingrid Klimke coach Pam Goodrich riding Zikomo, a 10 year-old Dutch Warmblood schooling Prix St. George. 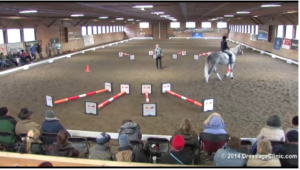 Each coaching session had Ingrid utilizing the cavaletti in a specific way to challenge yet not overface the horse. Young horses were introduced to the cavaletti in pairs with one horse providing courage for the other. These young horses focused on trot work on half circles and down long sides while grand prix horses were challenged with cantering the cavaletti on a 20 metre circle and other more difficult patterns. Here are Ingrid's top cavaletti teachings from the symposium. As the symposium continues into the next day, horses quickly become aware of their foot placement and rapidly learned to balance and carry themselves during the cavaletti work. Ingrid spaces her cavaletti 3 feet (80-90 cm) apart for the walk and 5 feet (120-140cm) for the trot. She allows wider outer distances when cavaletti are placed on a circle. For example, canter work often has inside cavaletti distances at 2 metres with outer distances at 3 metres on a 20 metre circle. Before the cavaletti work began, Ingrid insisted on all horses be thoroughly warmed up. “The first 10 minutes is walk to relax the ligaments and fluid in the joints,” says Ingrid. Following this, Ingrid focused on stretching where the horse is "long and forward over the back, stretching into your hand at the trot." At the end of a coaching session, horses were encouraged again to stretch long and low. No matter the training level of the horse, Ingrid encourages the riders to manage two aspects for the horse: the tempo and the path to the cavaletti. The horse must have energy when he approaches and must be guided to the centre of the cavaletti. The horse's job is doing the work of going over the cavletti. The rider must allow the horse the freedom to perform the work and learn from any mistakes he may make. Ingrid encourages clear riding with riders holding their hands above whithers with a fist-width apart allowing the reins along the neck to guide the horse. Ingrid also desires engagement by using half halts. She continually asks her riders to ‘take and give’ to achieve light, forward contact. Ingrid’s kind, positive style of coaching produced great results in all horse and rider combinations and engaged the audience over the two days. 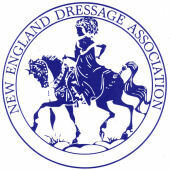 Click on the NEDA 2014 Symposium event link to watch a specific horse rider combination. 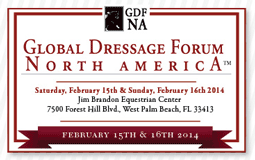 Copyright © 2019 Global Dressage Forum North America. All Rights Reserved.